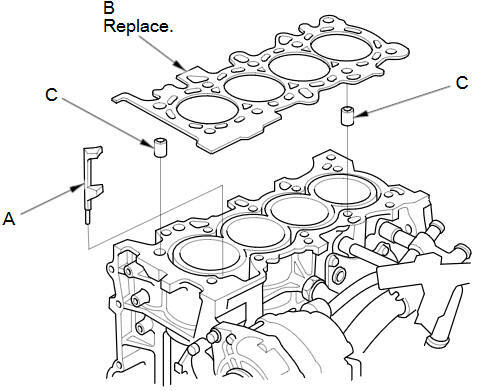 Install a new cylinder head gasket (B) and the dowel pins (C) on the engine block. Always use a new cylinder head gasket. 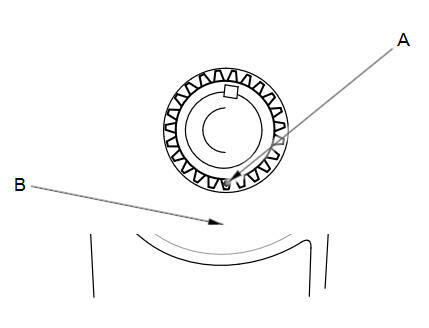 Set the crankshaft to top dead center (TDC). 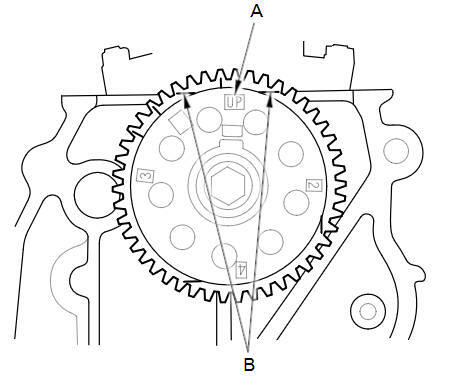 Align the TDC mark (A) on the crankshaft sprocket with the pointer (B) on the oil pump. Set the camshaft TDC. 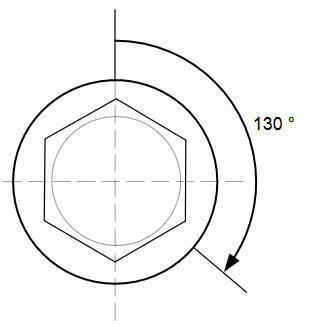 The UP'' mark (A) on the camshaft sprocket should be at the top, and the TDC grooves (B) on the camshaft sprocket should line up with the top edge of the head. 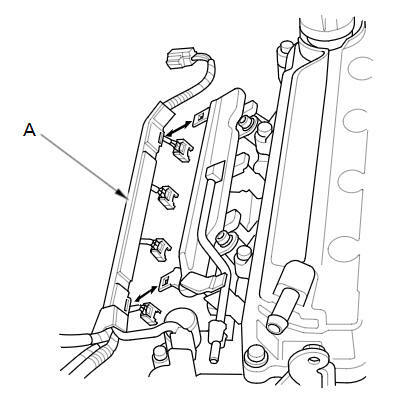 Apply new engine oil to the threads and flange of all cylinder head bolts. Torque the cylinder head bolts in sequence to 29 NВ·m (3.0 kgfВ·m, 22 lbfВ·ft) with a beam-type torque wrench if possible. When using a preset click-type torque wrench, be sure to tighten slowly and do not overtighten. If a bolt makes any noise while you are torquing it, loosen the bolt and retighten it from the first step. Tighten all cylinder head bolts an additional 130 В°. 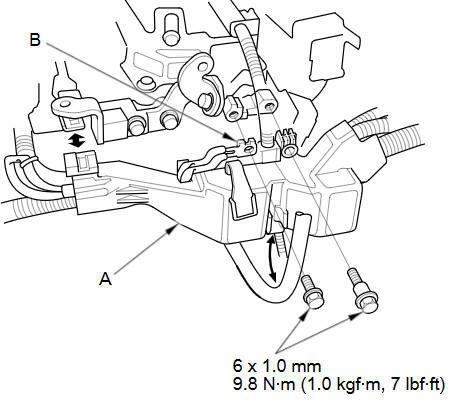 Install the harness holder (A), then install the ground cable (B). Install the harness holder (A) to the fuel rail. Install the warm up TWC. Install the intake manifold/chamber assembly. 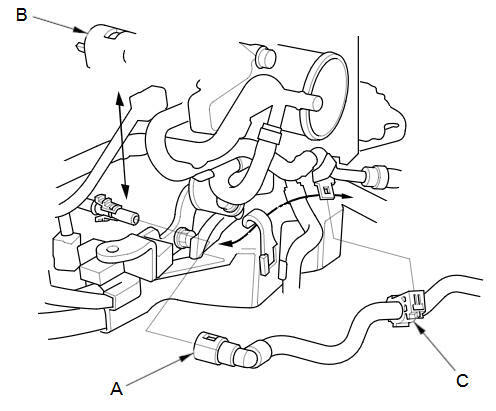 Install the heater hose to the clamps (D). 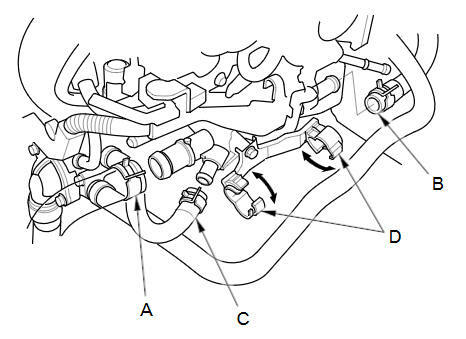 Connect the fuel feed hose (A), then install the quick-connect fitting cover (B) and the fuel feed hose clamp (C). Inspect for fuel leaks. Turn the ignition switch to ON (II) (do not operate the starter) so the fuel pump runs for about 2 seconds and pressurizes the fuel line. Repeat this operation three times, then check for fuel leakage at any point in the fuel line. Do the CKP pattern clear/CKP pattern learn procedure.